Two of my good friends got married in Charlotte a few weeks ago and I got to wear this fun outfit! 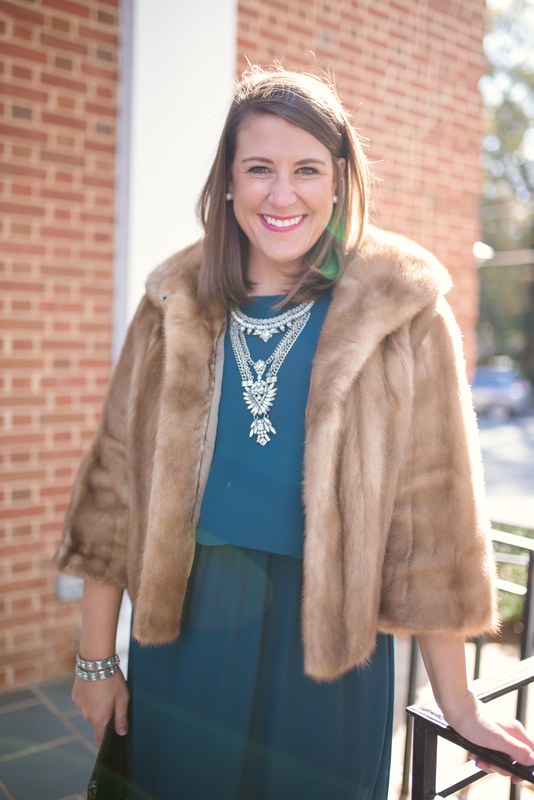 November in the South can be hit or miss for weather and the evening of the wedding was chilly and absolutely perfect for a fur coat. This look is special in more ways than one. Not only did I get to wear this to a beautiful ceremony where my friends pledged their lives to each other, but a couple of the pieces are really special to me. The fur coat belonged to my grandmother, Jean. She was totally Southern, through and through. Jean was a stylish woman with a collection of evening bags like you’ve never seen. I felt so honored to be able to wear something of hers. The other piece that is near to my heart is the ring. This ring was given to my mother on her 16th birthday from her parents. It is so pretty and has such a special meaning. I am so grateful she allowed me to have it and I wear it with a sense of pride and remembrance of my sweet grandparents. Do y’all have something special you wear that reminds you of a family member? Wait I need to know more about these fabulous shoes — are they easy to walk in? Yes!! They were so comfortable and easy to walk in. The heel is pretty chunky so they made me feel pretty stable and I’m a joke in heels!